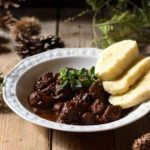 Goulash is not emblematic of just one country. 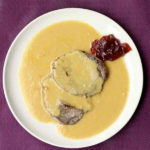 It is THE national dish of an entire region of Central Europe. 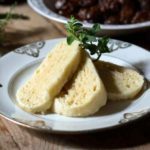 The Czechs, Hungarians, Moldovans, feast on this extraordinarily fragrant recipe from the first frost. 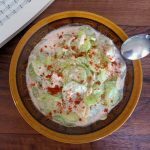 The Carpathian region, straddling more than eight countries, was at the origin of this dish which, before becoming festive, as is often the case in the history of gastronomy, started with peasants that were exhausted and hungry after a hard day in the fields. The spelling may differ from one country to another (gulyásleves in Hungary, gulasch in Austria and Germany, guláš in the Czech Republic and Slovakia, or gulaş in Romania), but everyone at least agrees on the essential ingredient: paprika. This deliciously intense red powder obtained from dried and crushed peppers gives a unique color and flavor to this “herd of cattle” soup (literal translation of goulash, or gulyas in Hungarian). 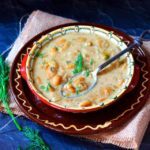 If the details vary, this goulash soup almost always contains meat, or sometimes beans like in Hungarian goulash. Generally, beef is used, but it can also be replaced with veal, pork, lamb or even horse, sheep and even game meat. Also, although it is considered a soup in Hungary, it is mostly referred to as a sauce in the Czech Republic. The Czechs add marjoram, a digestive and slightly minty herb that is a refreshing cousin of oregano found throughout the vegetable gardens in Europe. 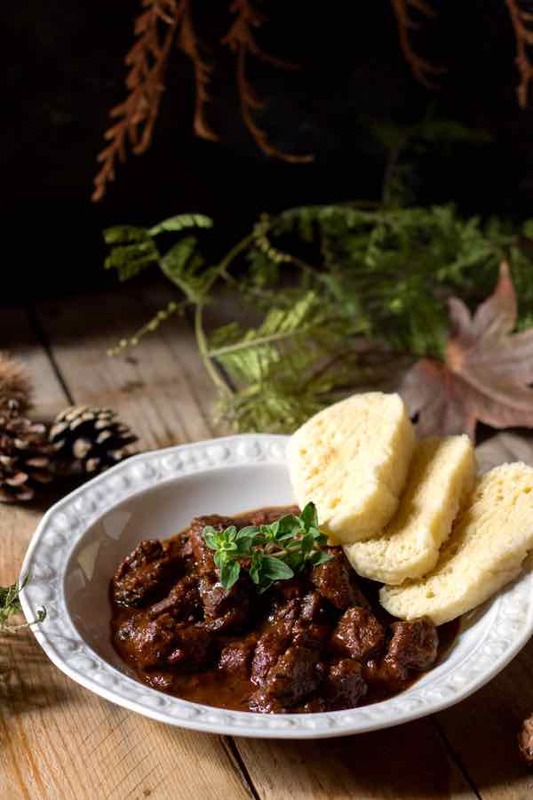 If the goulash has become a festive dish, it is because it is invariably linked to the notion of sharing. Pastoral life and transhumance forced peasants to travel long distances. To avoid carrying too much weight, it was necessary to travel light, and a single cauldron made it possible to prepare the goulash and share it by the fireside in the vast plains of the Carpathians. 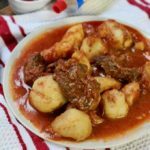 This goulash recipe probably dates back to the dawn of time, yet paprika, made from pepper, appeared in Europe in the seventeenth century. Since then, the recipe probably hasn’t changed much, just like all the great traditional dishes. 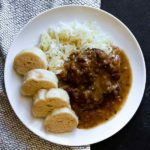 The Czechs accompany goulash with knedliky or knödel. It is a kind of dumpling made with eggs, bread (or dough) and yeast. Once cooked and sliced, they deliciously accompany the scented sauce of goulash. Since our trip to Prague, we are both very attached to Czech culture. A way of life quite close to the one we are used to in Paris. The people of Prague like to meet up after work to share a drink or a coffee, a piece of delicious cream cake and later, why not a goulash with a Pilsner, the iconic beer of the country. What could be more delectable than wandering the streets of Prague in the evening, with a full belly and a warm heart. Cross the Charles Bridge, either on one side or the other of the city, and go for a stroll, admiring the beautiful facades of these ancient buildings. Get lost in the reflection of the moon on the Vltava and have a last drink on the docks. 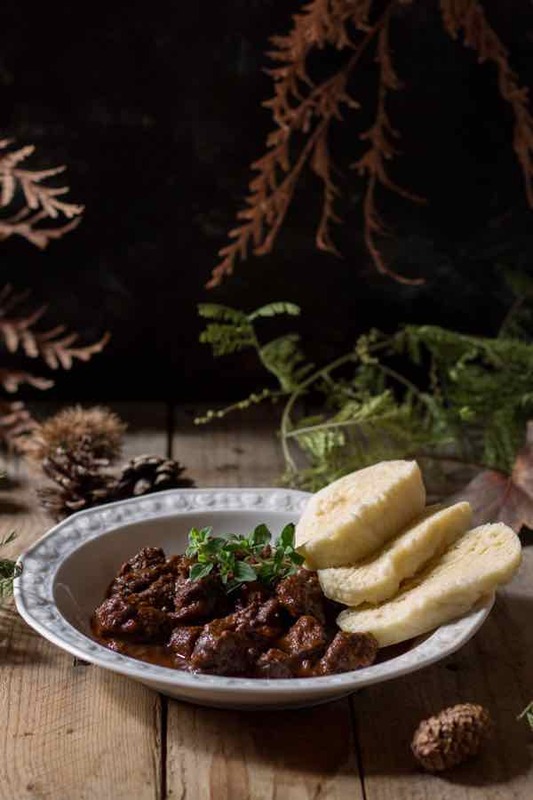 Goulash is like the Czechs, generous and friendly, comforting and spicy, refreshing and warm at the same time. It is as rich as its origins, it has hints of this Western Slavic soul shared by millions of Europeans who love life intensely, who love to live with passion and a touch of sweet madness that is so seductive. 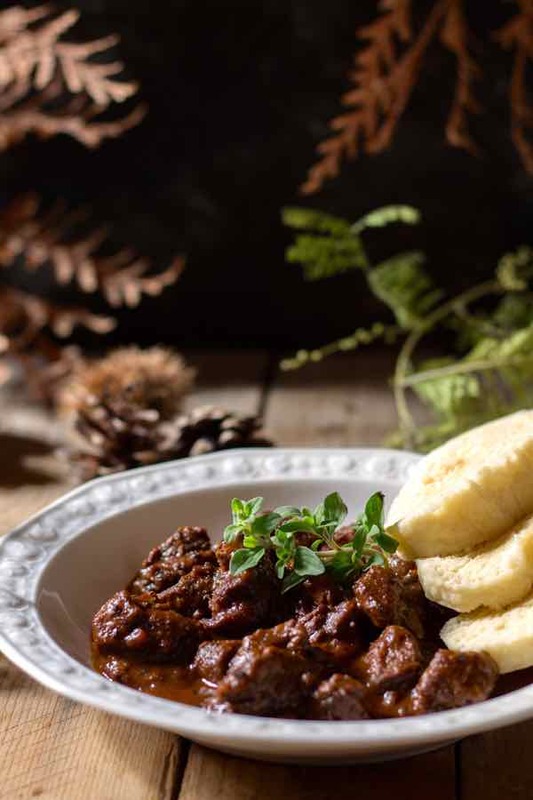 Goulash, a stew originally from Hungary, has for centuries been a popular comforting recipe in the Central European region of the Carpathian mountains. Heat the oil or lard on medium heat and brown the meat on all sides for a few minutes. Add onions, mix well and cook for 5 minutes over medium-high heat, stirring constantly. Add tomatoes, hot pepper (optional), allspice, paprika and caraway. Mix well. Cover with hot broth and mix well. Season with salt and pepper. Simmer for 2 hours over low heat, stirring gently. 30 minutes before the end of cooking, add marjoram and flour diluted in a small amount of boiling water. Adjust the seasoning if necessary. Check the tenderness of the meat. Cooking may have to be extended if necessary. If this is the case, adjust the amount of broth accordingly. The sauce should be plentiful and unctuous. Serve hot with fresh bread, as well as sliced scallions. Thank you for this lovely recipe. Looks very close to the Hungarian version?